Lately we’re getting some people contacting us concerned that we’re using timber pallets in helping to establish some of our food gardens. They’re worried that we’re using chemically treated pallets that will leach into our soils, contaminating the plants that we eat. 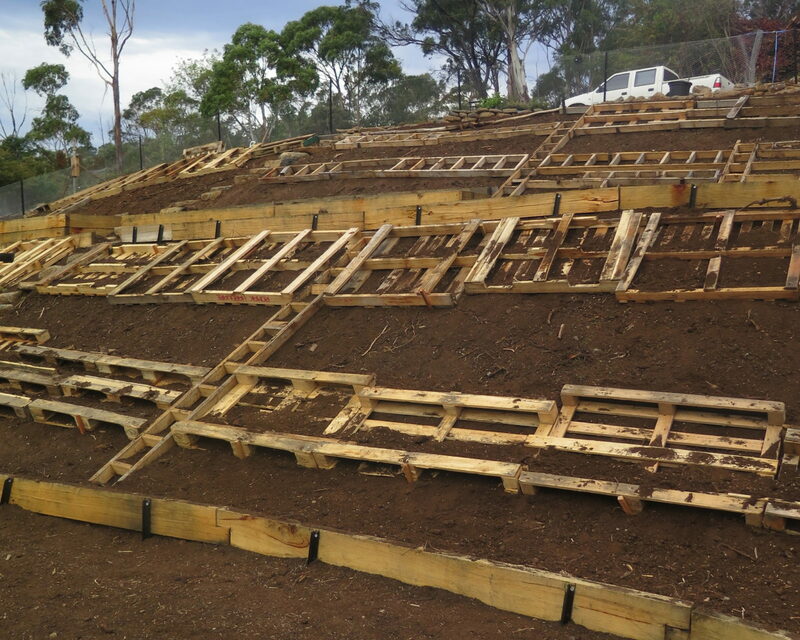 And fair enough – have you seen how many pallets we’re using to stabilise our earth berms??!! 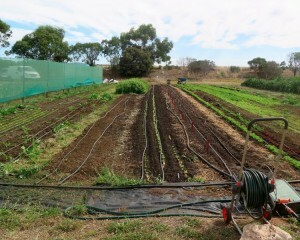 Two out of three of our earth berms we’re using timber pallets to stabilise the soil and plant into. Many, many, many pallets are finding their way off building sites and furniture store’s skip bins into our garden. 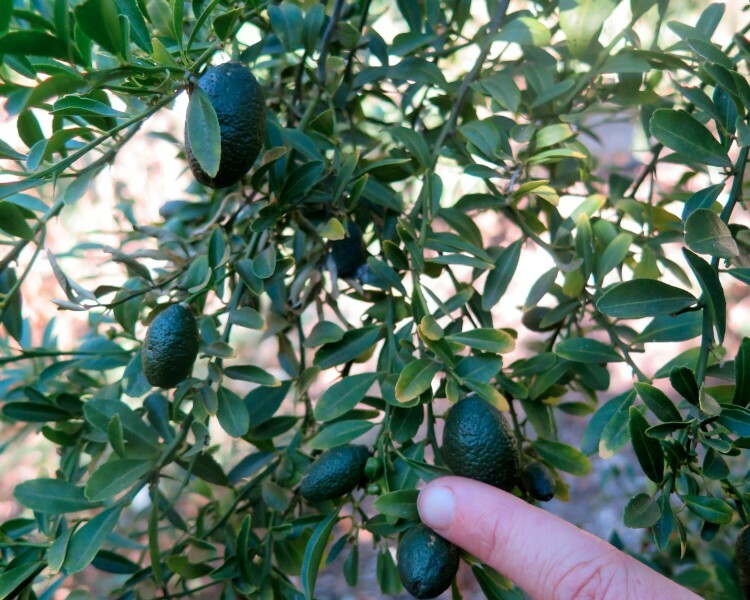 This winter we’re planting our edible forest gardens into them – so we really appreciate your concern. But fear not folks – the good news is we don’t use chemically treated pallets *at all*, only heat treated ones. 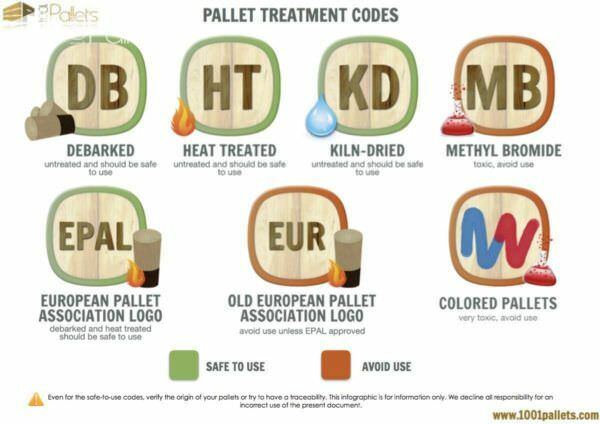 Here’s a brief overview of what type of pallets are out there and how to know which ones to choose. Thanks to 1001 pallets for summarising all the facts that I’m drawing on for this particular blog. *The IPPC Logo: if you don’t see it, don’t use it! 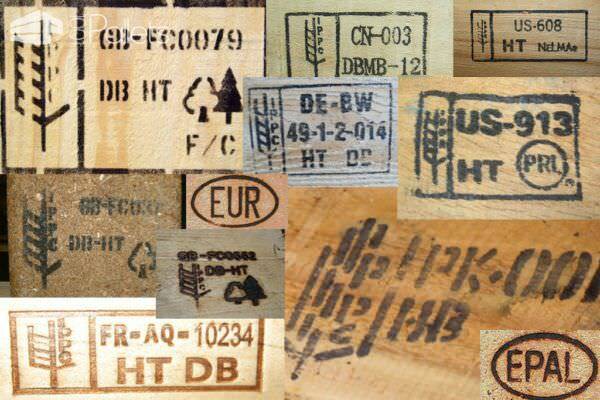 Even if a pallet may be perfectly safe without this logo, it could also mean that it was treated with chemicals! *The treatment code : [HT] = Heat treatment / [MB] = Methyl Bromide / [DB] = Debarked / [KD] = Kiln Dried. 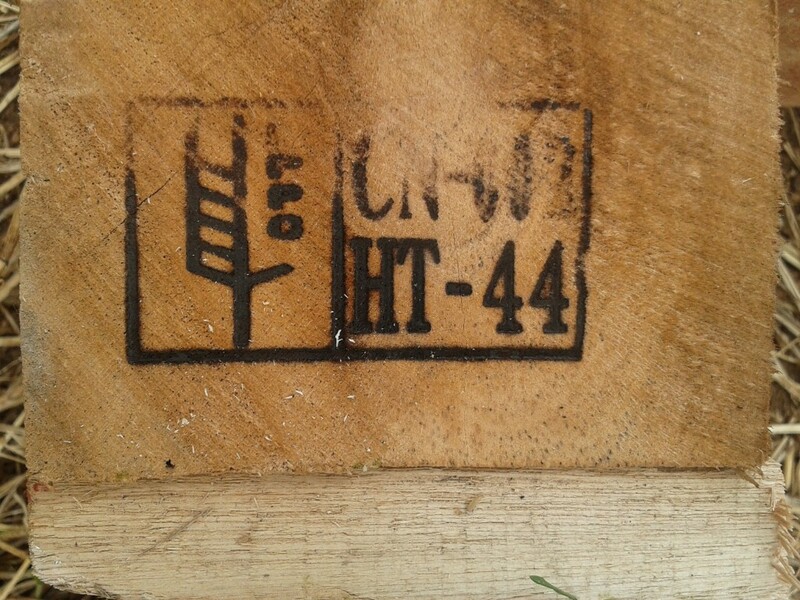 We only pick up pallets with the “HT” stamp on them as seen below – this is 100% safe to use. 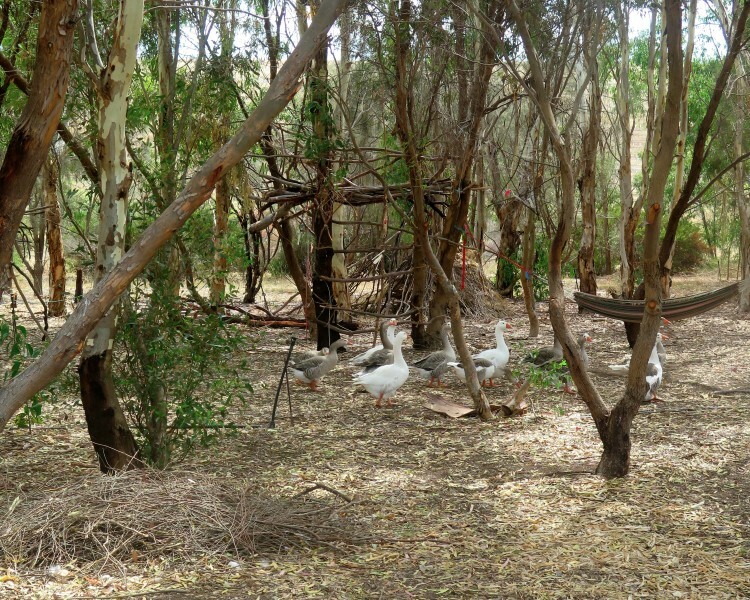 This particular photo is from when we built of rather beautiful and highly functional chook house all from pallets and all perfectly safe for our chooks to live in. Note the HT stamp above – this is what you’re looking for. Heat treated (HT) pallets are “built to break”, meaning they’ll start to break down within 5 years’ish as they’re not treated with any chemicals to preserve them. 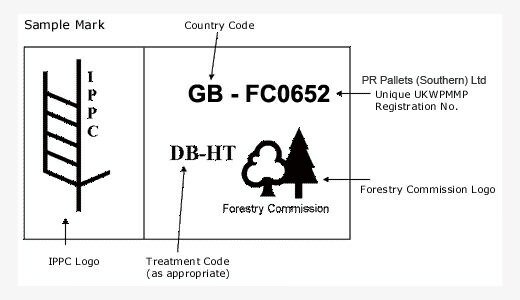 [They] undergo a pest control treatment called heat treating (HT) which involves heating the pallet to a minimum core temperature of 56°C for softwoods and 60°C for hardwoods for a minimum of 30 minutes in a kiln. HT pallets are not harmful to your health. 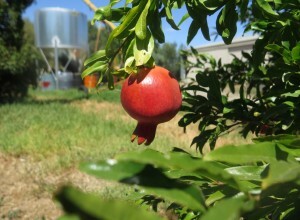 A word of caution: If you notice liquids spilt onto the pallet, don’t use it as it could be a harmful substance you really don’t want near your veggie patch. Better to be safe than sorry and considering there’s approximately a **g’zillion** pallets out there, you can afford to be picky. 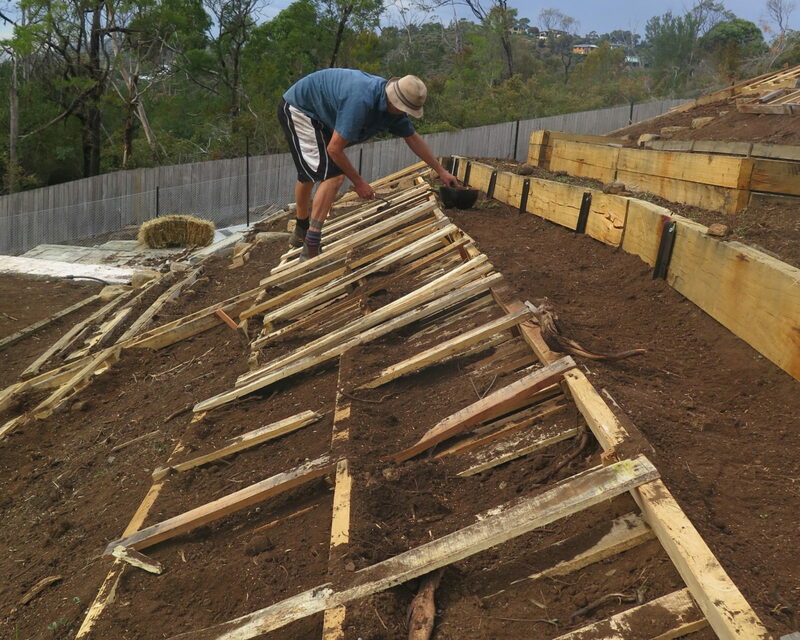 Above you can see Anton planting out comfrey roots into the pallets which will eventually take over the pallet’s role in stablising the slope with its deep tap roots. The pallets are temporary and will break down in place. 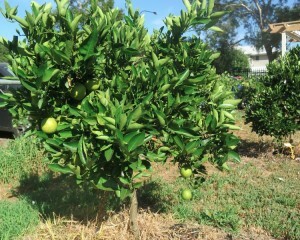 We wont bother trying to remove them, instead they’ll return to the soil – much better than ending up in landfill. What if there’s no stamp on the pallet? While it might be fine, we say leave it – the risk of contaminating your soil is not worth the risk. If you’d like to read up more, head on over to 1001 Pallets who’ve obviously dedicated enormous hours into researching everything pallets! On our recent trip to Adelaide, South Australia we made sure to catch up with some of our old and new farming and grower friends. It gives us *great* joy to see people we love and admire flourishing in and out of the soil. It also reinvigorates us to “keep going” ourselves. 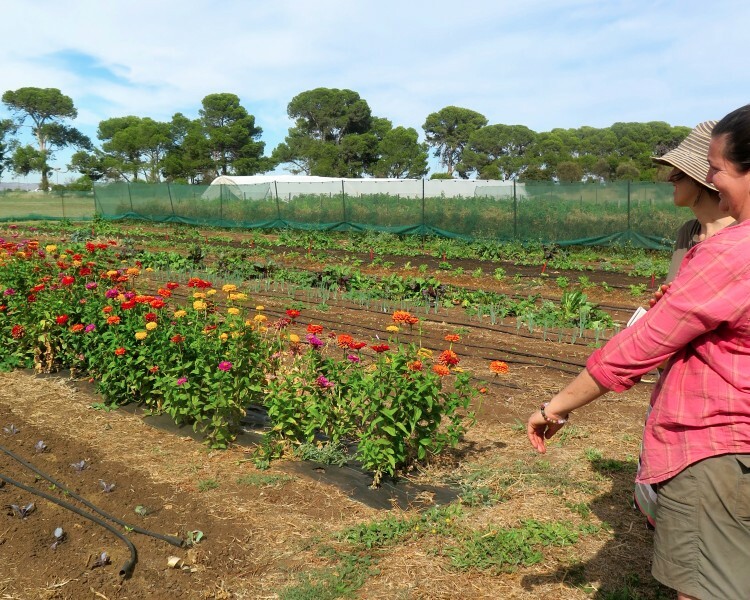 So, in the spirit of sharing and inspiring others – check out these three fabulous, dedicated South Australian growers we can’t get enough of. 15 years old and started by our very dear friend and horticulturalist, Brian Noone, the Woodville School Garden is a dense, multi-layered edible oasis in the middle of suburbia. 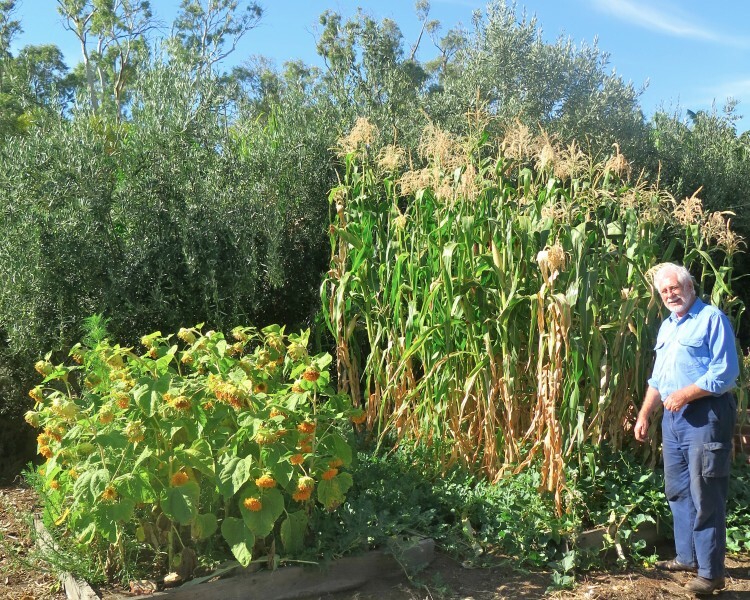 Brian started this garden from scratch on an old sports field. 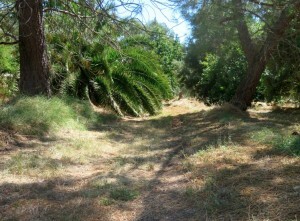 These days it’s now more like a food forest with mature fruit trees and patches of annuals scattered throughout. 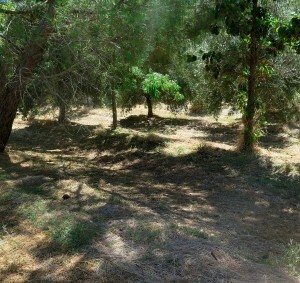 We visited on a *really* hot day and found refuge in this green, green garden of frog ponds, chickens, olive trees and corn so tall it cast beautiful shade. 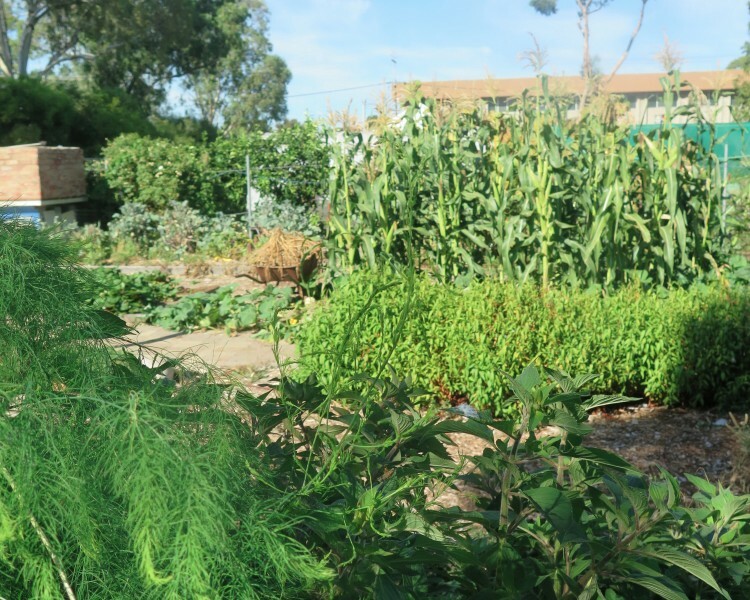 Brian works with a range of students in the garden – some of which are working towards their certificate two in horticulture. 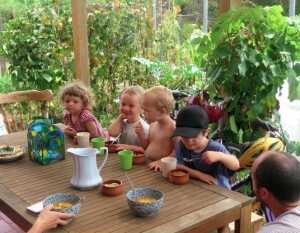 The local orchid group have set up a space to grow rare orchids and are teaching the kids how to do this themselves. 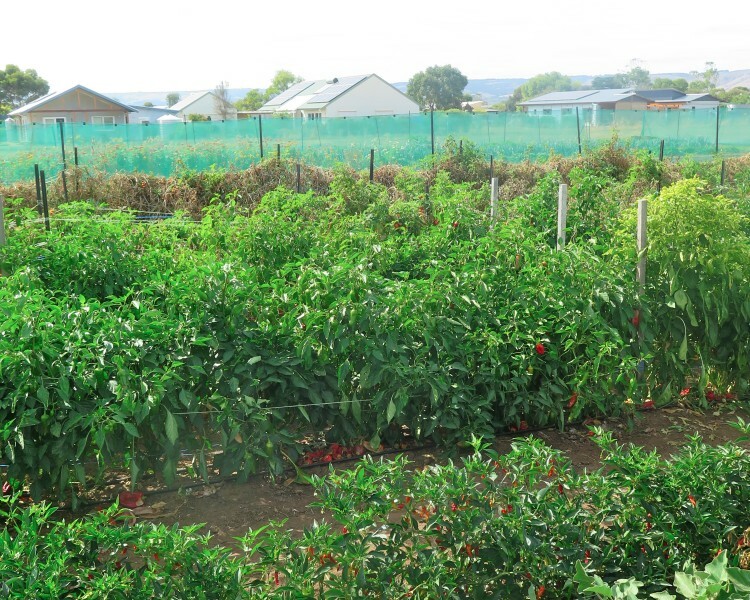 There’s also an aquaponics system on its way to being built, an extensive nursery and a pizza oven with an outdoor kitchen for celebrations and feasts. 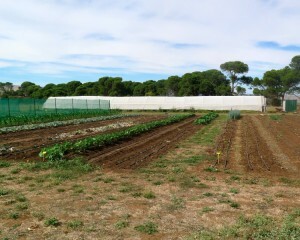 Without a doubt this is one of the best school gardens I’ve seen. Its high level of productivity and obvious involvement from a range of people in and out of the school is impressive. 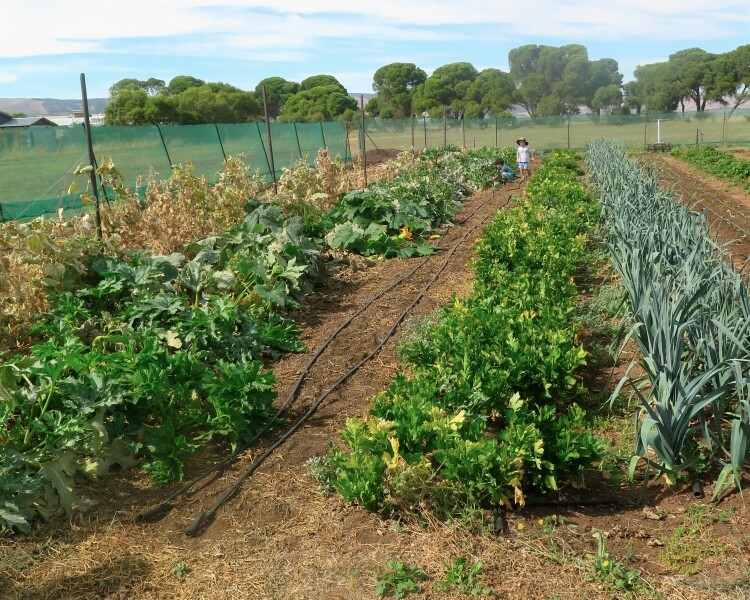 Too often school gardens are reduced to a collection of raised veggie beds “in the corner” and the opportunity for a long term food source is missed. Way to go Brian and Woodville School! 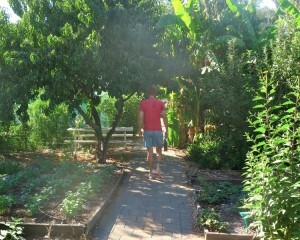 I first went to The Food Forest when I was 18 years old – 15 years ago. 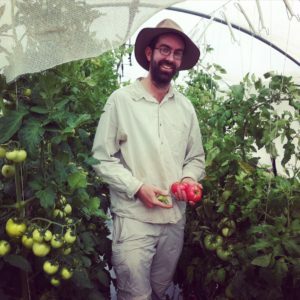 This is where I met Annemarie and Graham Bookman (the farmers) and had my “ah ha” moment about how effective and enjoyable permaculture can really be. It’s been 10 years since I was last there and it was such a joy to return with my little family, specifically to show Anton what I’ve been talking about consistently all these years! 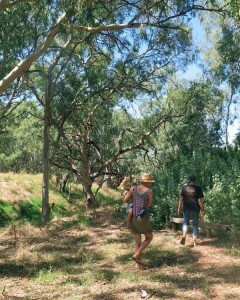 As soon as we arrived Annemarie said “Let me take you to one my favourite places” and we walked away from the pumping market garden and orchards towards the river and riparian zone of regenerated bush. 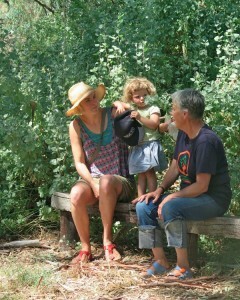 Sitting on a seat built by co-founder of permaculture, David Holmgren, Annemarie talked us through the evolution of this space and how it’s linked to restoring ecological stability to the area. In short, revegetating our water ways helps restore and stabilise ground water, rather than it rushing in and out of the landscape. There’s much more to it than that of course, years of thinking and hard work – but you get the jist. 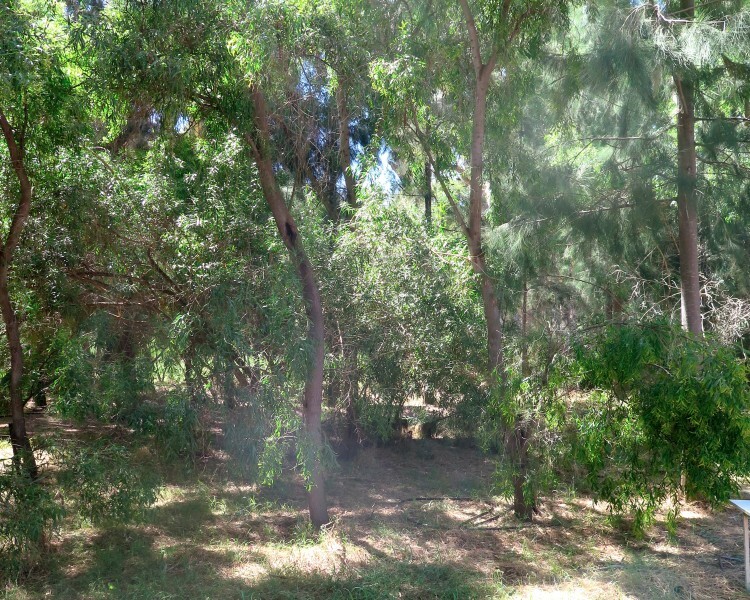 In recent years, due to a changing climate they made the decision to drill a bore to secure water for their already mature farm. Interestingly, they’re now investing a huge amount of energy to harvest water from the river (when running and healthy) and return it to the aquifer (through the bore via a settling pond and tanks ) to fill it up for times when they’re need to use it for irrigation. 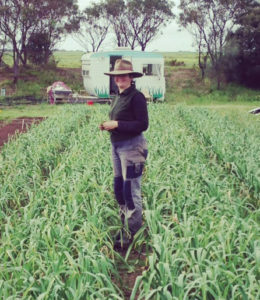 No other farmer has done this that I’m aware of – talk about ethical land/water management! 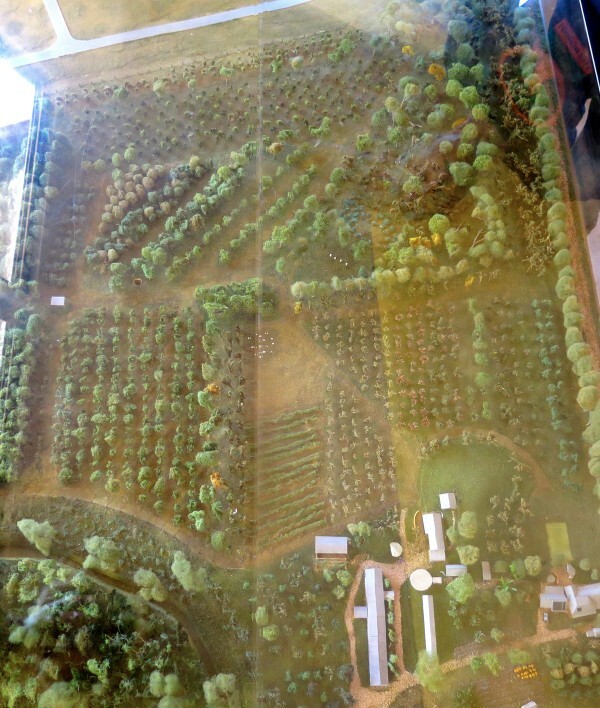 We didn’t have time to walk the whole 15 hectares on our short visit, but the model below does a pretty good job at showing the huge diversity of farm crops grown including pistachios, carobs, figs, mixed fruit, small animals and so much more. 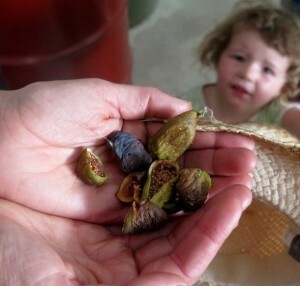 This diversity ensures ecological health and a varied income spread over the year. These people will forever be some of my favourites. Their work ethic, generosity, incredible knowledgable and just darn lovely characters will always be an inspiration to me and many, many others. Village Greens is only in its second growing season but operating like its an old hand at this market gardening gig. 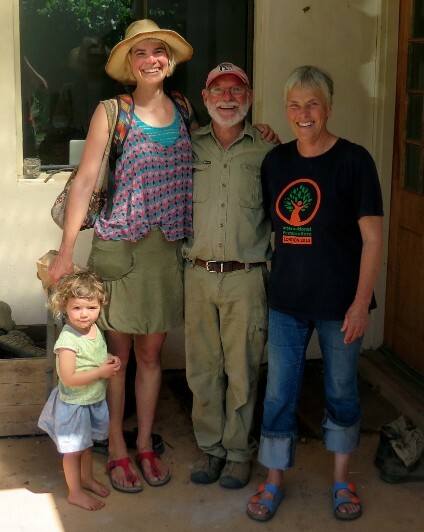 Beautifully designed and managed by Nat and Lucy, these two folks (and their team) are rocking this 1/2 acre of soil. 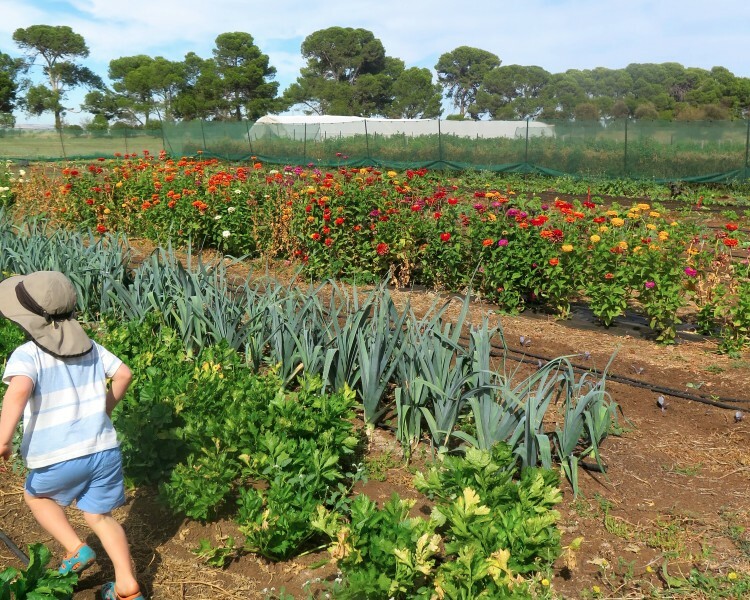 Nestled amongst the Aldinga Arts Eco Village the market garden grows a broad range of seasonal crops for sale at two local markets and does a fresh box delivery each week – they’re hard workers this mob. 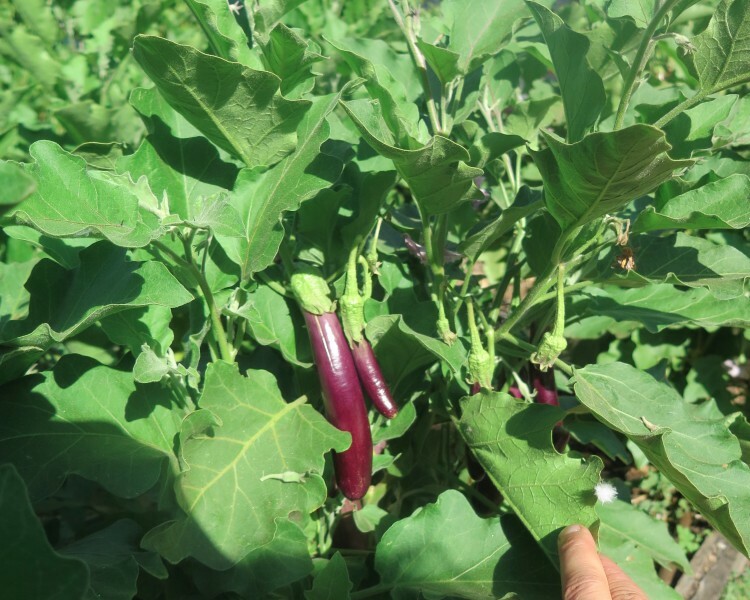 They grow over 40 different types of vegetables and while not certified organic, they use organic practices which support soil and plant health and result in delicious, nutrient-dense food. 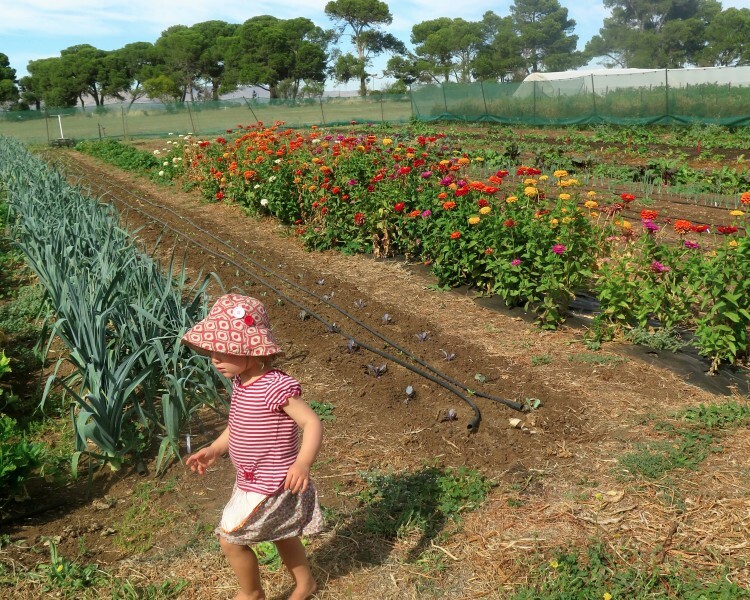 As we’ve worked on and around market gardens for many years we know what a good one looks like. 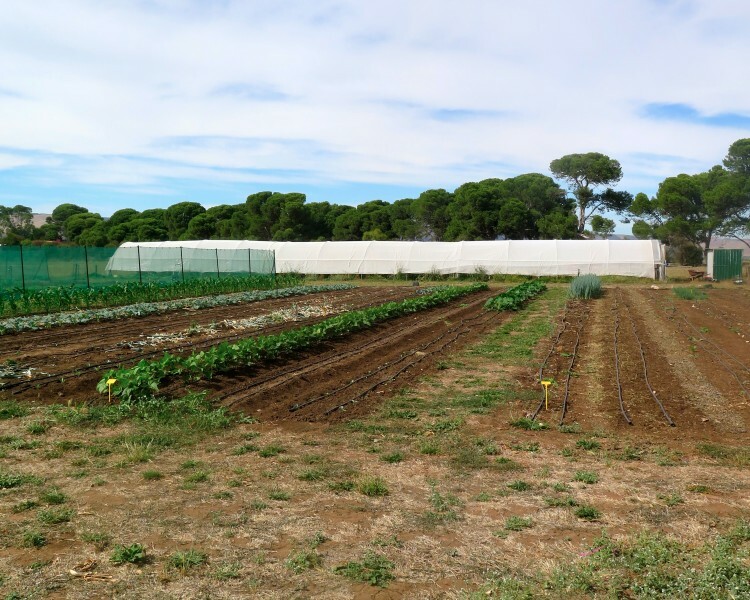 As soon as I walked into this garden I noticed really good succession of crops happening – this is the result of *many* hours of planning and probably an impressive Excel spreadsheet working out timing of what’s planted when and where. South Australia’s lucky to have these folks growing for them! 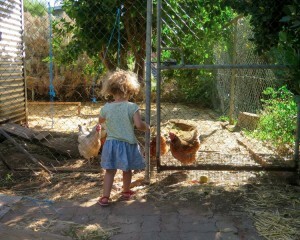 Adelaide – you continue to be known as Radelaide in my heart. Your people are of a particularly fantastic flavour and while you’re a bit too hot and dry for us, we love you deeply and dearly. Next to the market garden’s washing/packing/sorting shed is this cool-as forest where the local kids (from the Aldinga Arts Eco Village) have built this truly awesome bush play ground, complete with free ranging geese. 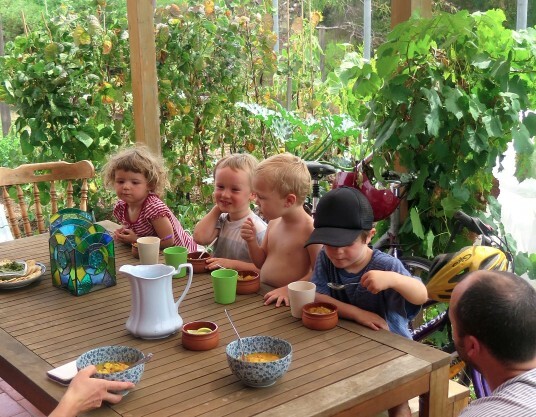 And after our little market garden tour we popped in to see some old friends for lunch and lined up all the little people for a garden lunch. So beautiful.